It is at least 50 feet long by 20 feet wide. 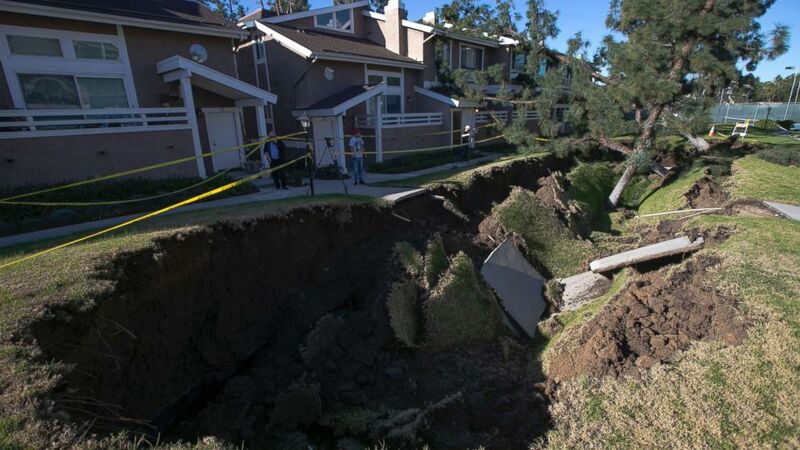 Authorities in Orange County, California are investigating what caused a massive sinkhole in an apartment complex in La Habra. "This is like a shocker to me," Jesus Leon, who lives in the area, told ABC News while looking at the hole, which runs at least 50 feet long by 20 feet wide, according to an estimate by experts on the ground. "What I thought, it was at first an earthquake, but nothing in the house was shaking," Reina Menchaca, a nearby resident, told ABC affiliate KABC. "So, we were wondering what it was and when I looked outside I saw the sinkhole." (Jae C. Hong/AP) A sinkhole is seen in a condominium complex, Jan. 24, 2019, in La Habra, Calif. The hole is estimated to be about 80 feet long and 20 feet wide. The ground collapsed Wednesday night, sucking parts of a courtyard deep into the earth. A sidewalk crumbled and several trees toppled over into surrounding apartments. In the immediate aftermath, a handful of apartments were voluntarily evacuated. "I’ve never seen anything like it certainly in our community," La Habra Mayor James Gomez told ABC News. As cadaver dogs searched for potential victims, local leaders diagnosed the problem. They believe a long concrete channel that transports water from the county flood control district collapsed. Now, they’re trying to figure out if the county or the city is ultimately responsible and if recent rain was a contributing factor. Authorities are now concerned that the rest of the courtyard could collapse but do not think that any residents or apartments will be further impacted.